I had a great day yesterday - and I'm still going! Prepared for a brunch with five, some last minute additions made for a Christmas morning brunch of 8. The three additional bodies were (and remain) always welcome, but this was their first time at my house. We rarely see these people throughout the year, so there was a small amount of "we have to be at our best and have our home inviting" nagging in my head. But I nipped that nagging in the bud. The only last minute thing I worried about was how to cook "good" scrambled eggs for 8 people. Everything else stayed the same, including the organization and delegation of duties. On Christmas Eve, Jason and I made cookies and popcorn balls. We cleared the counters, and made a list of the jobs that would need to be done to cook brunch the following morning. The list was then broken down in to who would do what - with the assurance that it would be read aloud when guests arrived. 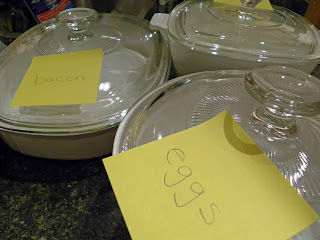 And - the best part - I labeled all of the dishes that items would be warmed it/served in. Labeling, and thinking about it before hand, meant that I wouldn't be scrambling while cooking, bending, reaching, and spinning around - spending spoons, and inducing wobbles. I survived the day, with a short nap in between events. And brunch was delicious . December 27, 2009 at 6:31 a.m. Wonderful! Organization and delegation works beautifully.